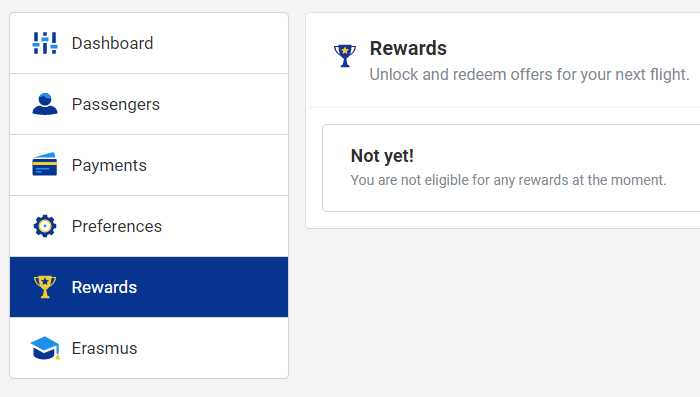 I recently noticed that Ryanair has a "Rewards" section on their dashboard. I tried to find out a bit more on the FAQ, but nothing really substantial came up. I googled and apparently there were some news, a couple of months ago, about Ryanair loyalty program being introduced. It said something about simplicity and being different from others, but again nothing really substantial. Does anyone know anything about this and what kind of benefits the loyalty program / rewards gives? Any NEW customer signing up to myRyanair and completing a full profile between Sept 7th – 9th inclusive will be entitled to a €10 travel credit off their next Ryanair flight departing Oct 1st – Dec 18th and Jan 10th – Jan 31st. Flight bookings must be made between Sept 7th – Sept 21st. It's likely that other reward programs would show up soon, but this is currently the only one. Not the answer you're looking for? Browse other questions tagged air-travel loyalty-programs ryanair or ask your own question. What disadvantages in not queueing early to board Ryanair flight? What's the cheapest “Digital Reward” in IHG Rewards Club?